Action Bank sounds like a slogan for a financial institution when it fact it’s the name of a fascinating video slot developed by Barcrest. It certainly takes inspiration from the developer’s bricks and mortar when you look at the symbols presented in the game but also features an innovative and creative bonus feature that can be pretty lucrative once activated. 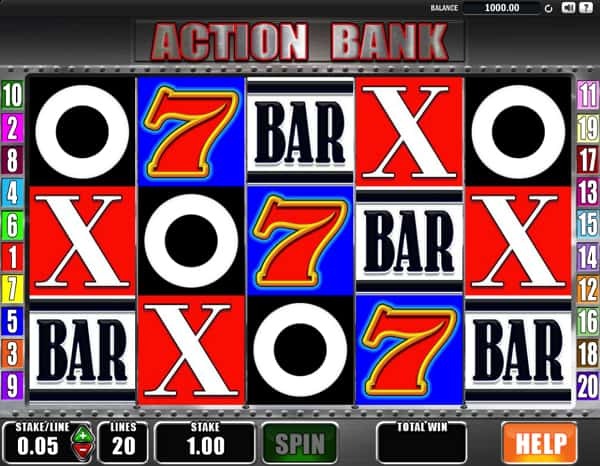 Action Bank is a 5 reel video slot with 3 rows featuring 20 fixed pay lines. The bonus features include wild symbols, scatter symbols and a free spin feature with a top jackpot bonus worth 500 times your total bet. The background looks like a bank vault that is heavily covered in cold, hard steel that is unbreakable by any force you can imagine. It’s fair to say that this video slot has seen better days when you first glance at it, but don’t let that disappoint you from giving this slot game a go. The traditional noughts and crosses theme will appeal to a wide range of players who will remember games like this found in arcades growing up. The game only features three main symbols including a cross, a bar and a big red seven symbol. Action Bank video slot only allows you to adjust the coin denomination section. The coin denominations range from a minimum of £0.01 and peaks at a maximum of £20.00. You can increase or decrease the coin values by using the plus and minus indicators located next to the stake/line field. The crazy joker dressed in red and blue represents the wild symbol and will gladly stand in for all other symbols except the scatter symbol. The golden vault icon acts as the scatter symbol and will unlock the main feature in Action Bank. The white circle symbols stand a chance of transforming into golden vault scatter symbols when you manage to display five of them in a single spin. The free spin feature will be triggered once this occurs on the reels. You will then be requested to pick one of the golden vaults which will reward you with between 5 and 30 free spins. You will also have the opportunity to increase the number of spins with a gamble feature prior to the free spin feature. Be careful, as you can lose all your free spins as well. The free spins will get underway with double symbols added onto the reels which enable bigger wins and longer pay lines. The free spin feature can also be re-triggered by displaying five more golden vault scatter symbols during the free spin feature. Additionally, you can also randomly activate the Big Bank bonus feature which is a picking round, offering three multipliers – sapphire, ruby and diamonds up to 500 times. Action Bank is great fun as it combines up-to-date features with a traditional look and feel. The Return to Player has been set to 96.28% and with the game volatility level on medium you will get a perfect balance where you will receive frequent wins containing decent amounts of cash prizes with every winning combination triggered on the reels. Action Bank is a video slot form Barcrest Games that can be found at Videoslots Casino.